On Oct. 24, Donald Trump administration effectively paused refugee admissions from 11 countries mostly in the Middle East and Africa, pending a 90-day security review, which was set to expire in late January. WASHINGTON: A federal judge in Seattle partially blocked U.S. President Donald Trump's newest restrictions on refugee admissions on Saturday, the latest legal defeat for his efforts to curtail immigration and travel to the United States. The decision by U.S. District Judge James Robart is the first judicial curb on rules the Trump administration put into place in late October that have contributed significantly to a precipitous drop in the number of refugees being admitted into the country. Refugees and groups that assist them argued in court that the administration's policies violated the Constitution and federal rulemaking procedures, among other claims. Department of Justice attorneys argued in part that U.S. law grants the executive branch the authority to limit refugee admissions in the way that it had done so. On Oct. 24, the Trump administration effectively paused refugee admissions from 11 countries mostly in the Middle East and Africa, pending a 90-day security review, which was set to expire in late January. The countries subject to the review are Egypt, Iran, Iraq, Libya, Mali, North Korea, Somalia, South Sudan, Sudan, Syria and Yemen. For each of the last three years, refugees from the 11 countries made up more than 40 percent of U.S. admissions. A Reuters review of State Department data showed that as the review went into effect, refugee admissions from the 11 countries plummeted. Robart ruled that the administration could carry out the security review, but that it could not stop processing or admitting refugees from the 11 countries in the meantime, as long as those refugees have a "bona fide" connection to the United States. As part of its new restrictions, the Trump administration had also paused a program that allowed for family reunification for refugees, pending further security screening procedures being put into place. Robart ordered the government to re-start the program, known as "follow-to-join". Approximately 2,000 refugees were admitted into the United States in fiscal year 2015 under the program, according to Department of Homeland Security data. Refugee advocacy groups praised Robart's decision. "This ruling brings relief to thousands of refugees in precarious situations in the Middle East and East Africa, as well as to refugees already in the U.S. who are trying to reunite with their spouses and children," said Mariko Hirose, litigation director for the International Refugee Assistance Project, one of the plaintiffs in the case. A Justice Department spokeswoman, Lauren Ehrsam, said the department disagrees with Robart's ruling and is "currently evaluating the next steps". Robart, who was appointed to the bench by Republican former President George W. Bush, emerged from relative obscurity in February, when he issued a temporary order to lift the first version of Trump's travel ban. On Twitter, Trump called him a "so-called judge" whose "ridiculous" opinion "essentially takes law-enforcement away from our country". Robart's ruling represented the second legal defeat in two days for the Trump administration. 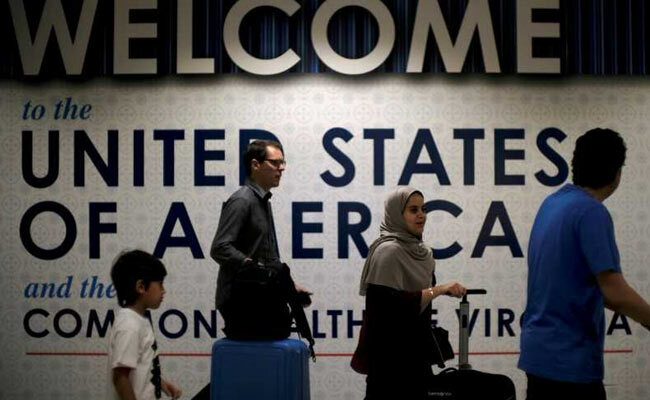 On Friday, a U.S. appeals court said Trump's travel ban targeting six Muslim-majority countries should not be applied to people with strong U.S. ties, but said its ruling would be put on hold pending a decision by the U.S. Supreme Court.